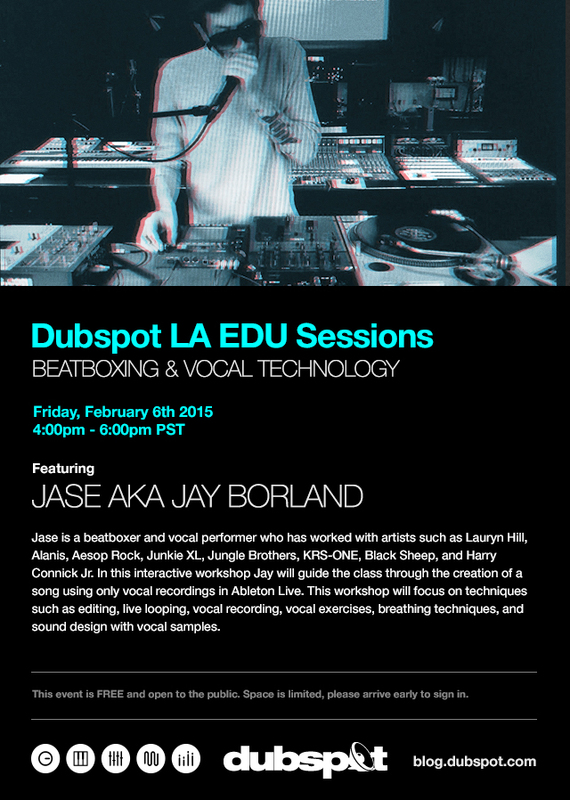 On Friday February 6th, join us at Dubspot LA for EDU Sessions with beatboxer extraordinaire Jase Mason while he demonstrates his unique approach at sound design to create a song using only vocal recordings in Ableton Live. Classes starting in NYC, LA, and online. Register now! In this interactive workshop Jase will demonstrate his unique approach to sound design while creating a song using only vocal recordings in Ableton Live. This workshop will focus on techniques such as editing, live looping, vocal recording, vocal exercises, breathing techniques, and sound design concepts with vocal samples and vocal effects processing hardware. Jay Borland (aka JASE) is a beatboxer and vocal performer who has worked with artists such as Lauryn Hill, Alanis, Aesop Rock, Junkie XL, Jungle Brothers, KRS-ONE, Black Sheep, Alanis Morissette, and Harry Connick Jr. Pushing the boundaries, this multi-talented vocal specialist continues to impress with his unique vocal sound effects and ability to adapt his voice for any type of recording. His improv and interactive performances display an impressive blend of human sound effects, beatboxing, DJing, voice-overs, and stand up comedy, all while encompassing today’s technology through electronic hardware and software. Jase Mason’s beatboxing skills will have you wondering if he is making that sound or a machine? Check out some more of Jase’s talents in Dubspot’s Road Test w/ Abe Duque: Boss VE-20 FX Pedal – Vocal Effects Processing.